Eat lots of cake for me. Last night I spent nearly an hour wishing I could read lips. Being sadly deprived of new episodes of the Vicar of Dibley for ages I was excited when Bill told me a new one would air Christmas night. I should tell you first that I'm in the United States. And, BBC America will probably not air the new Vicar special for at least a year. 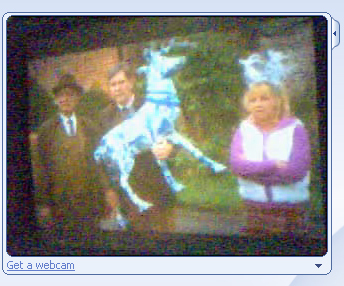 So, my dear friend Bill set up his web cam facing the tv so I wouldn't have to miss it. 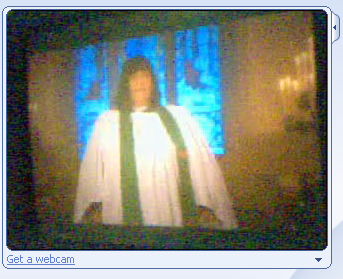 Yep, I watched the Vicar of Dibley via web cam on Christmas night. And, even without the sound, I enjoyed it. Thank you Bill!!! It must be sunday, so here's this week's animated short. I little ditty I can relate to. Hey num, um um um, hey num, um um um, Heeeeyyy... ooooh. Recently, when no one was looking, the evil Kendra slipped in unannounced. (Okay, Bill invited her. But it sounds better my way.) Beware the Kendra. She's an IHOP parking lot wrestler. And not a good one at that. I still say Bub won. And if the Digital Camera I wanted had been in stock at (insert electronic superstore name here) I'd have the pics to prove it. Maple syrup is our friend. Long live IHOP. Goodnight. Is this the best multi-player game ever? Maybe not. But dragging letters around a fridge door is good for a few moments time wasting. 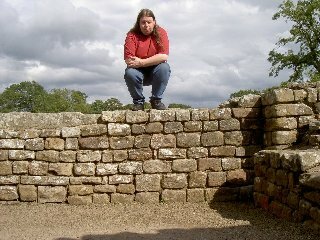 Just found that "Myth Busters" is shown over here in England. (Mondays at 10PM on Discovery.) It came highly recommended. I've only seen the one, but I like the look of it so far. Actually I found it yesterday, and I've only just thought of it. Never mind. 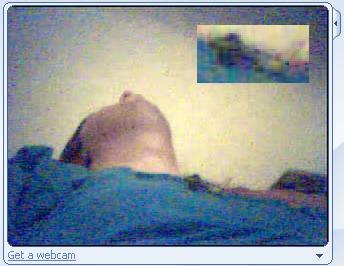 Take a look at the picture of of me dozing in from a webcam. Eagle eyed reader Neil spotted an oddity in the picture. Alien invaders? Gnomes? Robots? Ghosts? Someone call James Randi! I just noticed the time stamp on my last post. It's 3:19 am here. Honestly. I'm here, and Bill's there. Where you ask, is here? Or for that matter, where is there? The better question is, why am I updating a blog when I'm obviously sleep-deprived. Good question. I haven't an answer. So there. I'm awake at 3am watching Woody Allen on TV. He's a young man in the film and I'm amazed at how little he's changed. Granted, gravity is no longer a close personal friend of his. But aside from the droopiness, he's much the same. It's funny how some people seem the same for decades. Now that I think about it, physically he's different. But I don't think of him as a physical entity. He's more an idea or bundle of almost tangible issues to me. So I guess, the timeless quality I sense in him is neurosis. Unchanged, unbridled neurosis keeps him forever young. Hmm. I'm sitting up at 3am watching Woody Allen on TV. What's New, Pussycat? Very little. If you've not noticed, the Hamster Times is up and running again. Has been for 7 editions. It's just Neil's thing now, but he generously credits me for my meagre contributions. Read it, its a good laugh. I've got a big zip file with all the stuff from the HT from way back. I should think about putting it all together on a web site in a nice consistent manner. It's best not to use video-conferencing late at night whilst sitting in a comfy sofa.